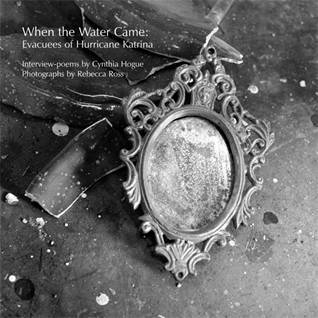 Cynthia Hogue has published seven collections of poetry, most recently The Incognito Body (2006), Or Consequence (2010), both with Red Hen Press, and When the Water Came: Evacuees of Hurricane Katrina (University of New Orleans Press, 2010). Among her honors are a Fulbright-Hayes Fellowship to Iceland and an NEA for poetry. Hogue received a Wurlitzer Foundation Residency Fellowship in 2009, and a Witter Bynner Translation Residency Fellowship at the Santa Fe Art Institute in 2010. She is the Maxine and Jonathan Marshall Chair in Modern and Contemporary Poetry in English at Arizona State University. When the Water Came: Evacuees of Hurricane Katrina features interview-poems and photographs of Hurricane Katrina evacuees who passed through, evacuated, or relocated to Arizona.� Poet Cynthia Hogue created poems from interviews with evacuees, using only the interviewees� words, re-ordered and shaped formally and visually to communicate the depth of these individual experiences, and to highlight the poetry of their language. Through black-and-white, medium format photographs, co-author Rebecca Ross examined evacuees� recreated present and retraced their steps to relate a poignant sense of journey and beginning again. Responding to the itinerant nature of the evacuees who participated in this project, the artists document individual lives profoundly touched by Katrina, in order to tell a universal story of broken lives and the courage to begin anew. One enters Devreaux Baker�s haunting new collection, The Red Willow People, as one would sacred terrain. These poems are spare, tactile and textured, but they hover between worlds: �I do not know why the ghost of the woman from the pueblo // visits me,� one speaker confesses. This visitation is a gift, but it carries with it the task of journeying to that �core place // where bone meets spirit,� �the other side of air,� through time and �beyond knowing.� The Red Willow People is a book of visionary medicine, for though Baker walks through �the thin field/ of grief,� she does so to instruct and heal, walking in a rare beauty and in magic to write these gorgeously wise poems.